The scent of Little Saigon hits me in the face. An intoxicating perfume of jackfruit and bananas and the vanilla-y scent of pandanus leaves wraps itself around me in a warm, tight embrace. It’s a sunny Friday afternoon, and the line to purchase something cold and sweet at Thach Che Hien Khanh in Garden Grove stretches out the front door and down the sidewalk, past a vendor of exotic fruits and knickknacks — chopsticks, paper lanterns, plastic Buddhas, various figurines of the lunar zodiac. Incense from a nearby shop muscles itself into the mix. As I get closer to the dessert counter, I see dozens of wildly colorful puddings and cakes and sheet-pans filled with fluorescent mounds of sticky rice. The young woman directly in front of me is nervously eying something in the display case. “Ohhhh,” she says, anxiously tugging on her friend’s arm every time someone orders one. I can see now what they’re talking about. It’s something I will later learn is called banh da lon, which resembles a layer cake but is actually alternating ribbons of bright green and yellowish gelatin made from pandanus leaves, coconut and mung beans. They are flying off the shelf, but everyone on this day, including me, seems able to score at least one. 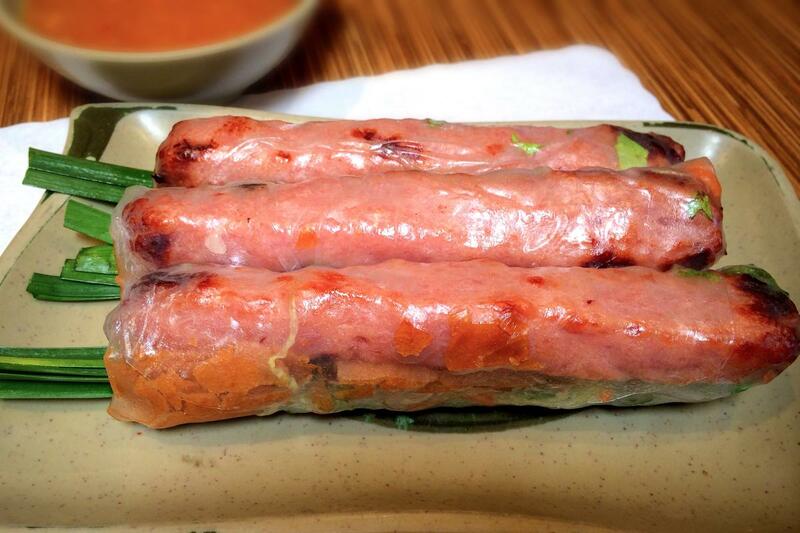 I want to taste more than just banh da lon, though. I change tack. I see something that looks like the sweet corn porridge I discovered earlier this year at a street vendor in Vietnam, so I point to that one instead. “I’ll take some of that,” I say. “And a No. 3 che,” pointing to the colorful milk tea pictured on the wall with “#3” on it. I have no idea what’s in it, but it looks like a fun mix of green, white, blue and red squiggles. After visiting Vietnam again in February, I decided it was time that I got to know Little Saigon a little better. It’s an exploration that began even before I moved to Orange County, thanks to a couple of Vietnamese-American friends who live in Garden Grove and eat out daily. They took me under their wings and introduced me to all of their favorites before turning me loose to explore on my own. 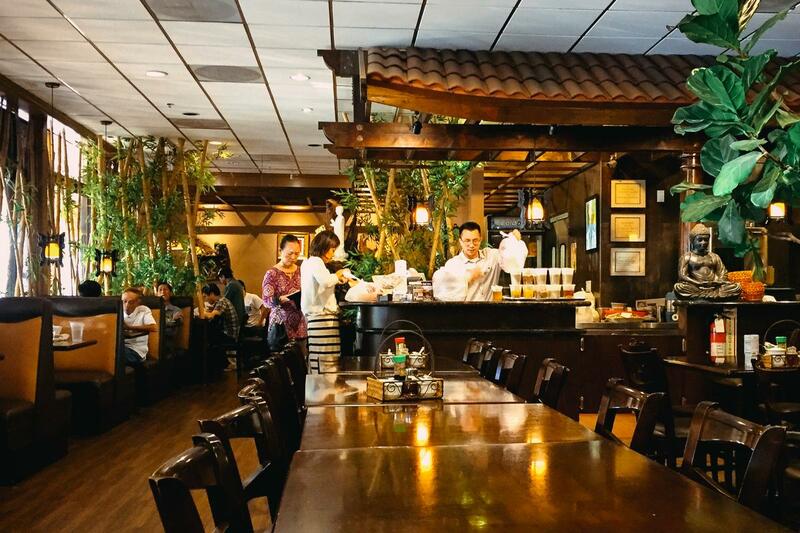 In all, I have dined at more than 50 restaurants in Westminster, Garden Grove and Fountain Valley. It sometimes feels like I’ve barely scratched the surface. Little Saigon can easily overwhelm. 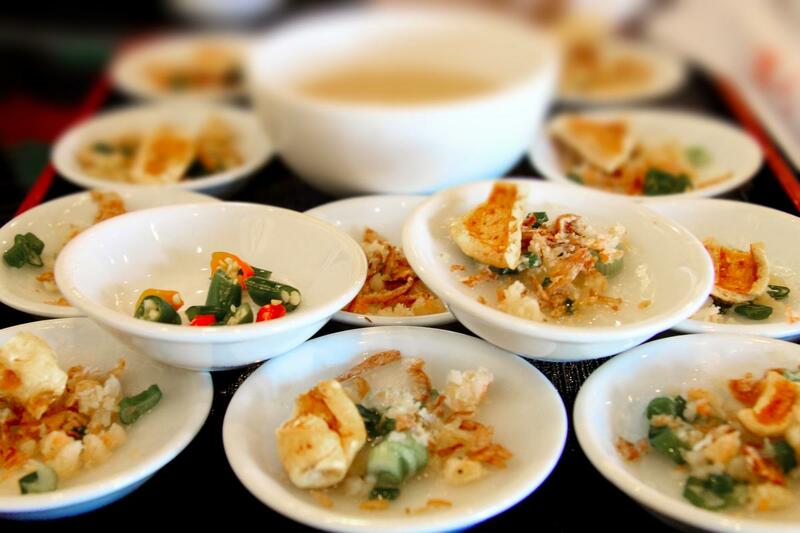 There are thousands of restaurants to consider, many of which don’t offer menus in English, or menus at all. It’s a collision of two worlds, not of east and west but rather of old and new. 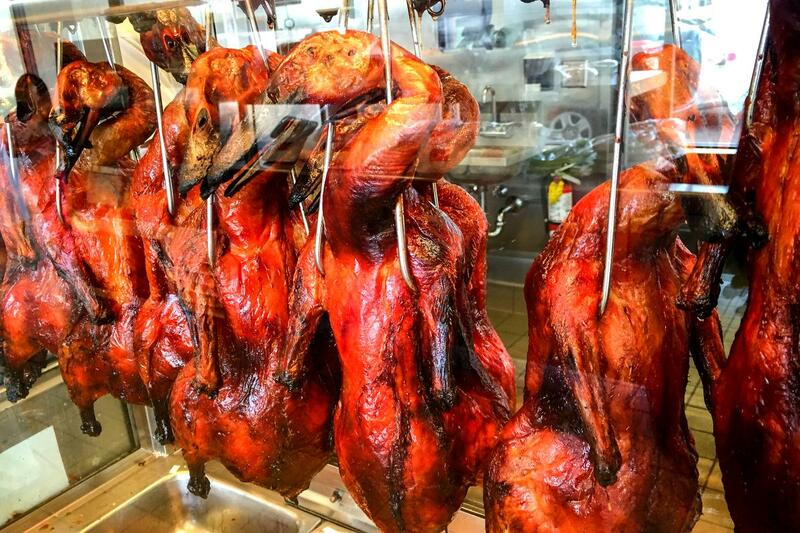 Old barbecue joints — with ducks hanging by their necks and pigs by their tails — exist alongside trendy shaved-ice parlors and noodle cafes. It’s common to see old men squatting on plastic stools and smoking cigarettes outside one shop, while next door you see teenagers wearing fancy designer jeans and sending text messages between slurps of milk tea. But where the generations overlap, there is great food. Lots of it. 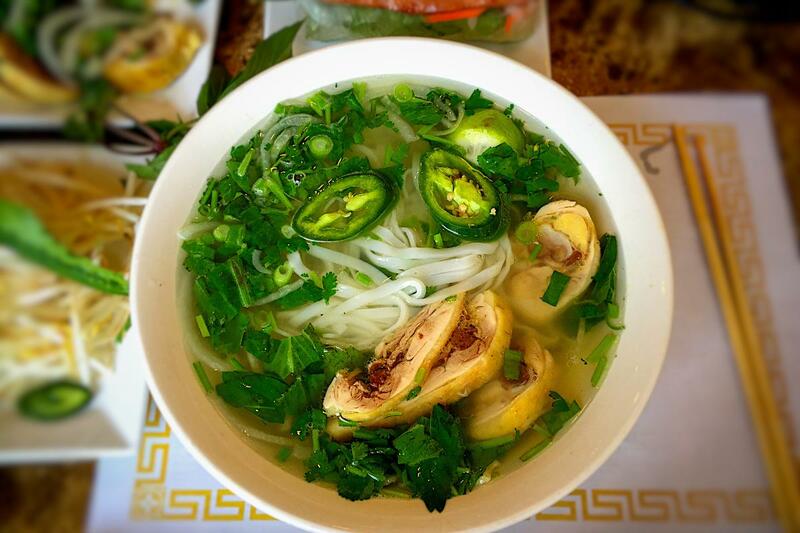 Here are the 25 best things I’ve found to eat — and then some — in Little Saigon. All restaurants are open daily unless noted. 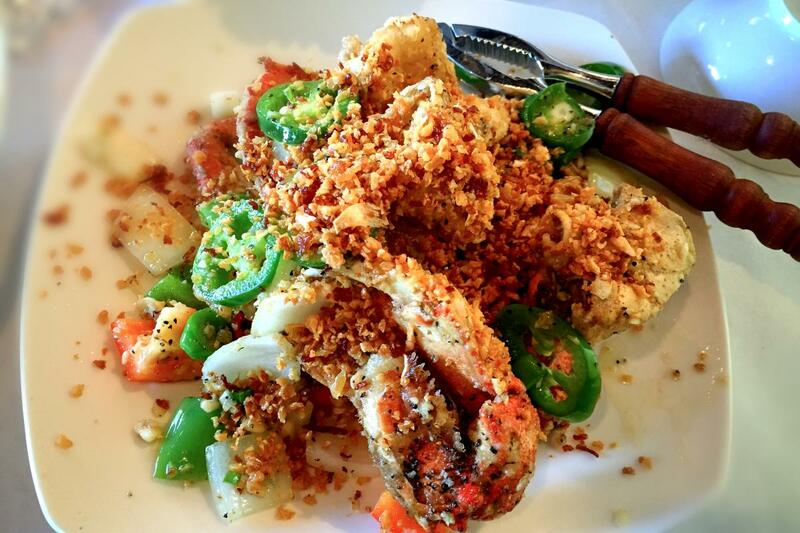 Garlic crab is a specialty at Garlic & Chives. 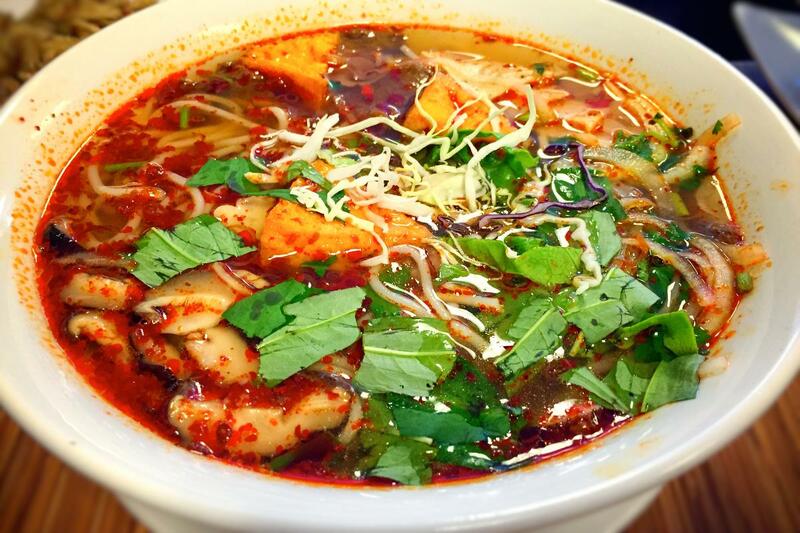 Red Crab in Westminster features bun rieu, a bowl of tofu, tomatoes and rice vermicelli soup. 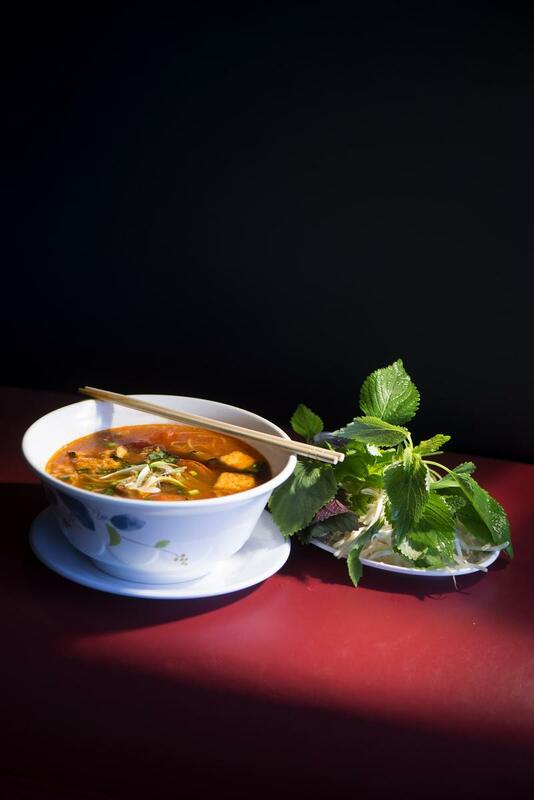 Bean spouts, marjoram, Water Morning Glory and perilla accent the popular Vietnamese dish. This is a fun new crawfish place sort of like Boiling Crab but much smaller, more intimate and very fun. The owner is a young trendy Vietnamese guy who would be very photogenic. I donÕt know his name, but heÕs always there, mingling with customers. And if we were to photograph a couple of dishes here, IÕd suggest photographing the bun rieu and the mussels in coconut sauce. 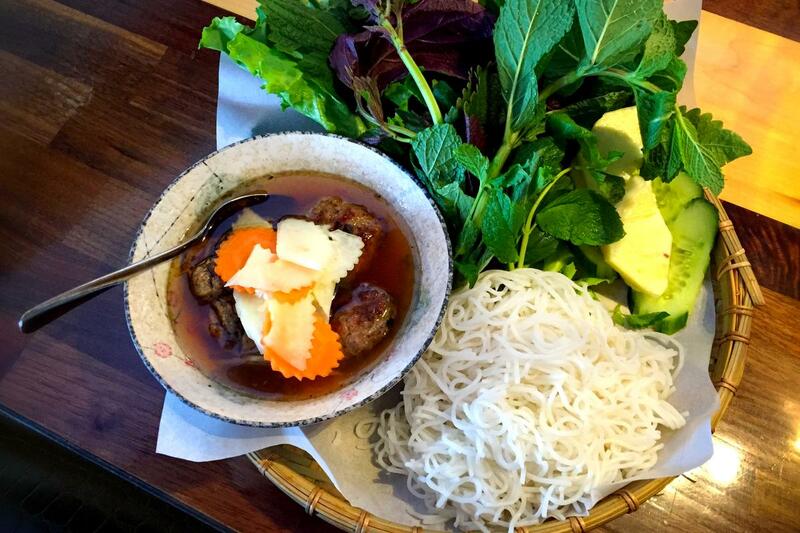 Bun cha Hanoi at Tra House is just like the real deal on the streets of Hanoi. Chicken pho at Hien Thanh. 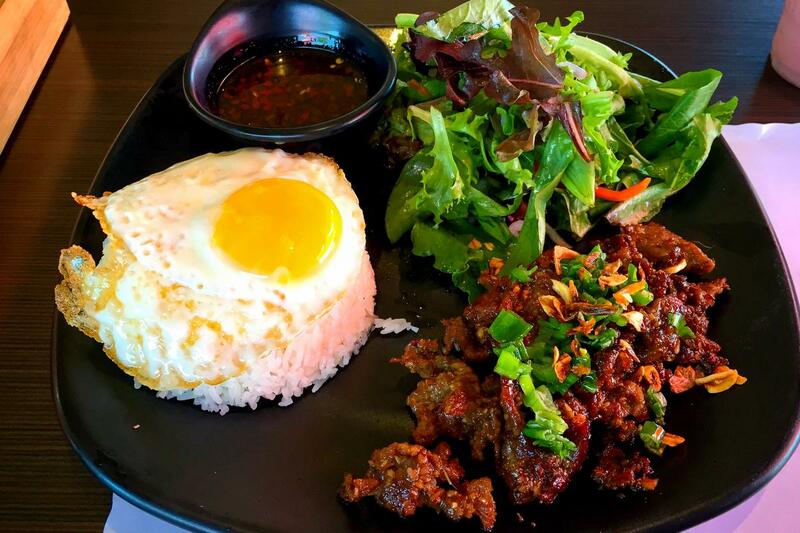 Grilled beef with a fried egg at Q1 Tea Lounge. Some of the best imperial rolls (fried spring rolls) can be found at Vien Dong. Barbecued pork and ducks at New Duong Son BBQ. 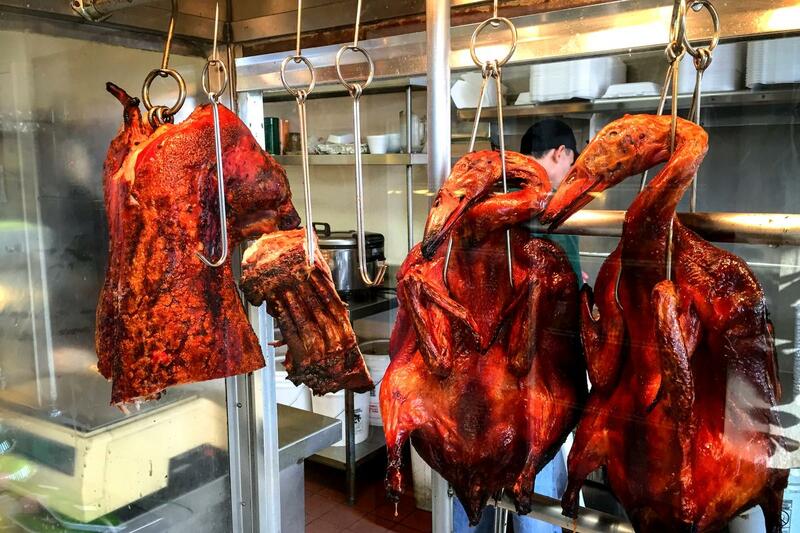 Barbecue ducks at Lien Hoa BBQ. 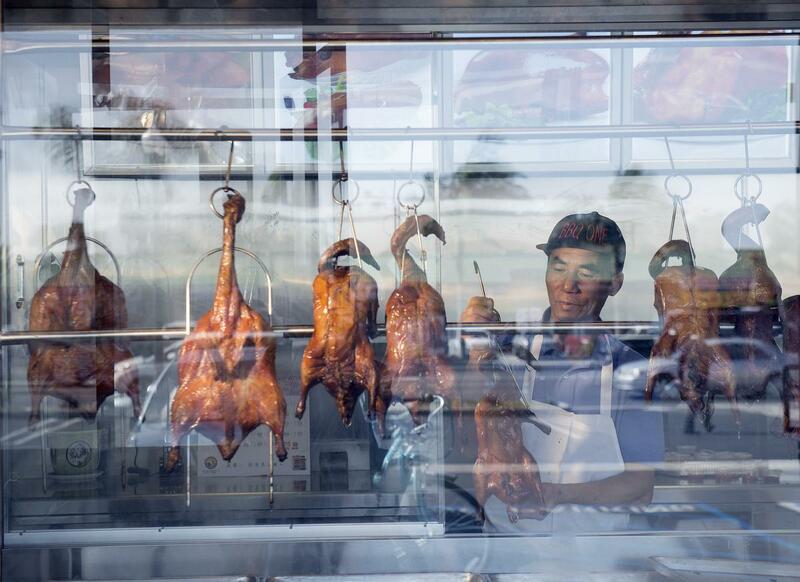 Chef Hung Quynh of BBQ One hangs barbecued duck at a popular new Chinese/Vietnamese Westminster eatery. Whole soy sauce chickens, chicken liver and more are in steam pans behind the counter. This newcomer is one of the only BBQ specialists where guests can actually sit down and eat on the premises. This is a popular new Chinese/Vietnamese bbq place, with lots of bbq ducks and pork ribs hanging in the display cases, plus lots of whole soy sauce chickens in pans behind the counter. There are several great bbq restaurants in Little Saigon, but this newcomer is one of the only bbq specialists where you can actually sit down and eat on the premises. Chinese barbecue at BBQ One, Lien Hoa and New Duong Son: Chinese barbecue became an integral component in Vietnamese cooking a long, long time ago, and it’s a tradition that has thankfully not been lost in Little Saigon. The newest player is BBQ One, which opened this year next door to the legendary Lien Hoa and one block from the just as famous and always excellent New Duong Son. They all sell essentially the same things: barbecue duck, barbecue pork and soy sauce chicken. I bought samples of everything from all three places on the same day to compare, and it’s really hard to pick a winner. But I do love the idea of sitting down for a meal at BBQ One, whereas the others offer only takeout. 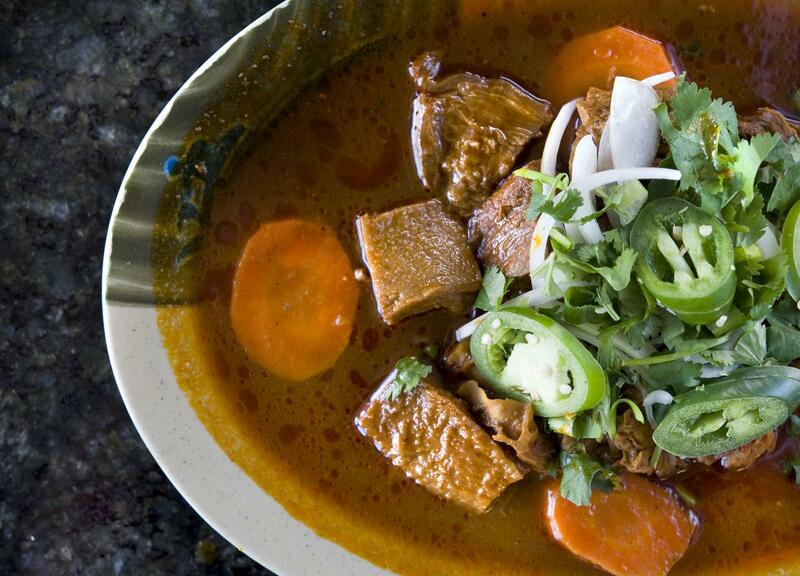 Le Croissant Dore serves a beef stew dish known as Bo Kho in Vietnamese. The French bakery and restaurant is located in Westminster. 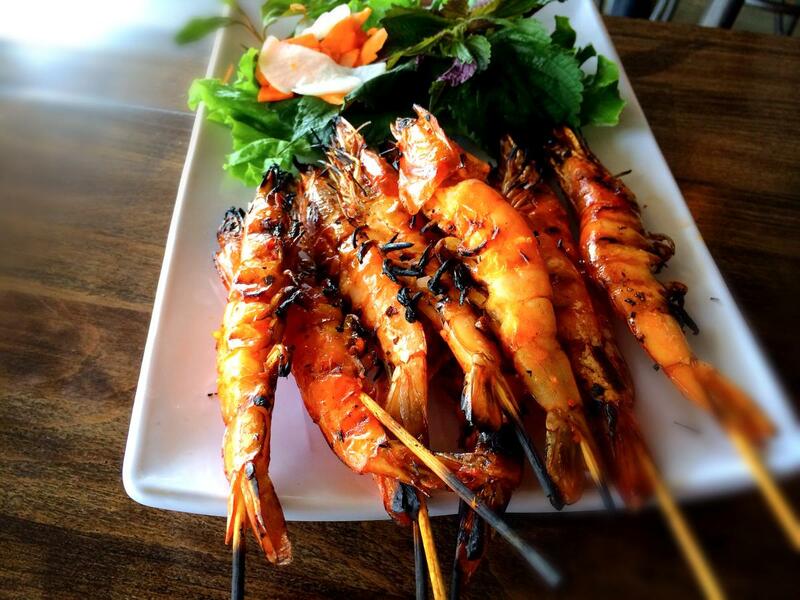 Grilled shrimp at Rice Paper. 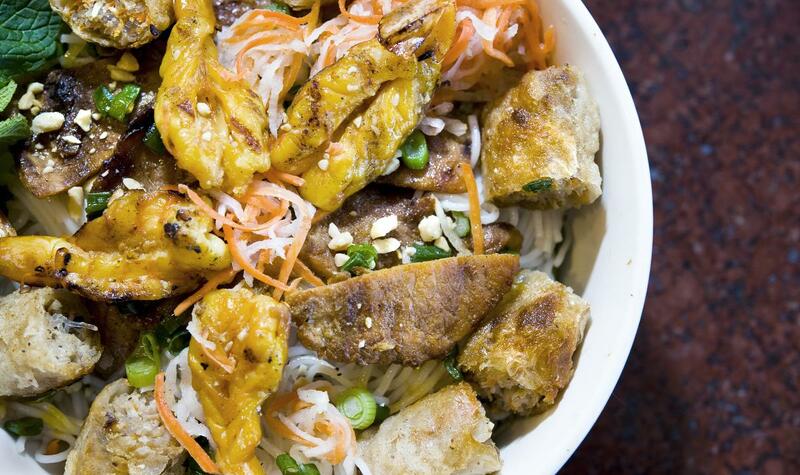 Bun is a cold vermicelli noodle bowl with pork, shrimp and imperial roll served at Thanh My restaurant in Westminster. 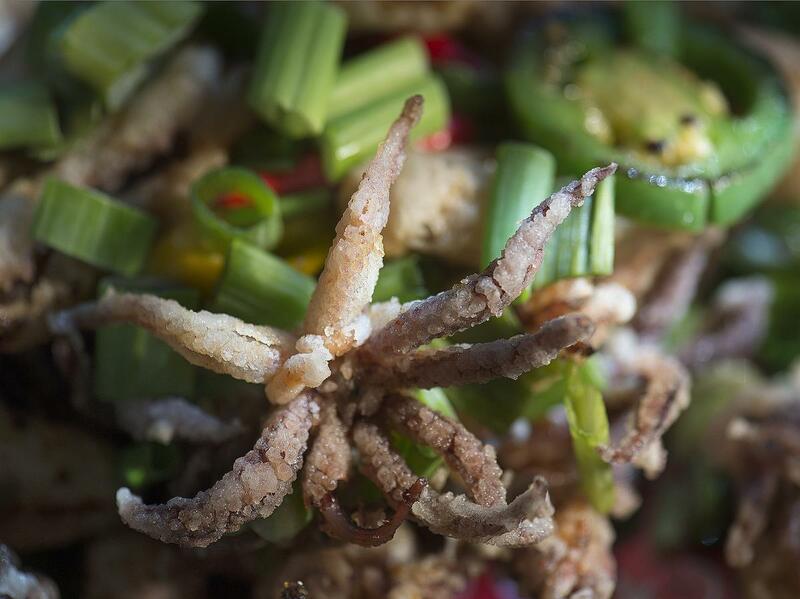 A mound of crispy squid with spicy salt and pepper and jalapeños is offered at Tan Cang Newport Seafood in Garden Grove. A note, I had trouble setting this up due to the language barrier. I had someone here in the office who speaks Vietnamese help me. So there may be some communication stumbles out there that day. But they do know we are coming and what we want to shoot. 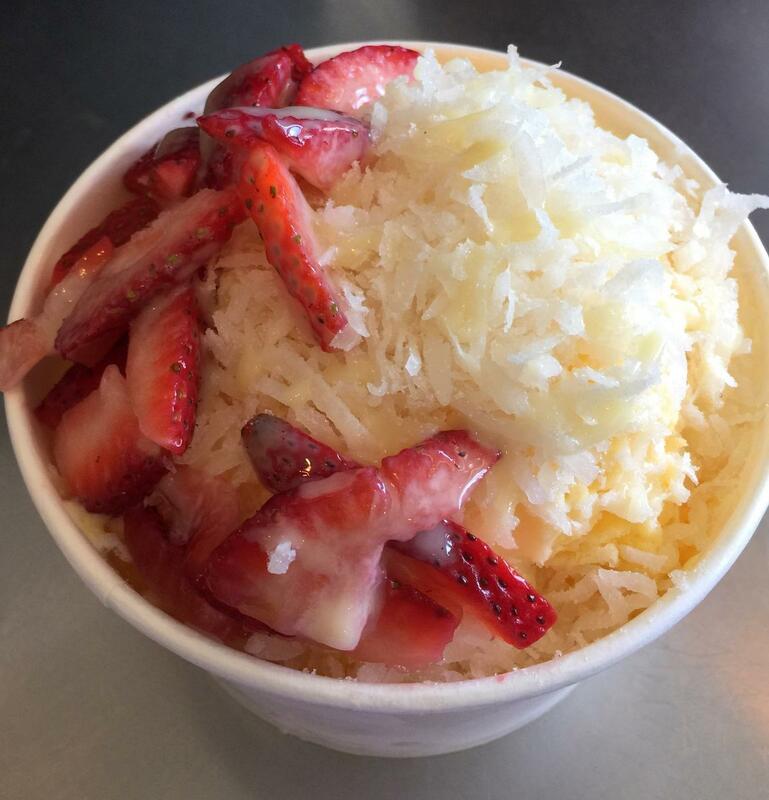 Go to Snow Monster for the shaved ice dessert. 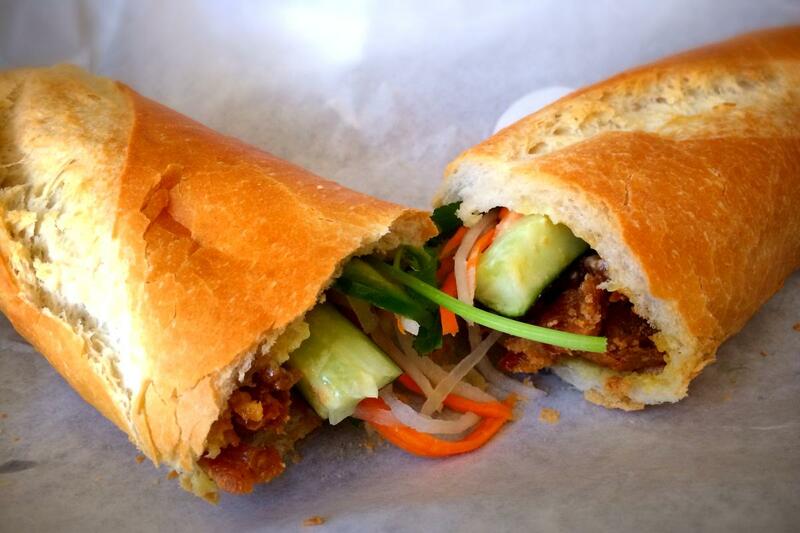 Grilled pork banh mi sandwich at Lynda Sandwich. 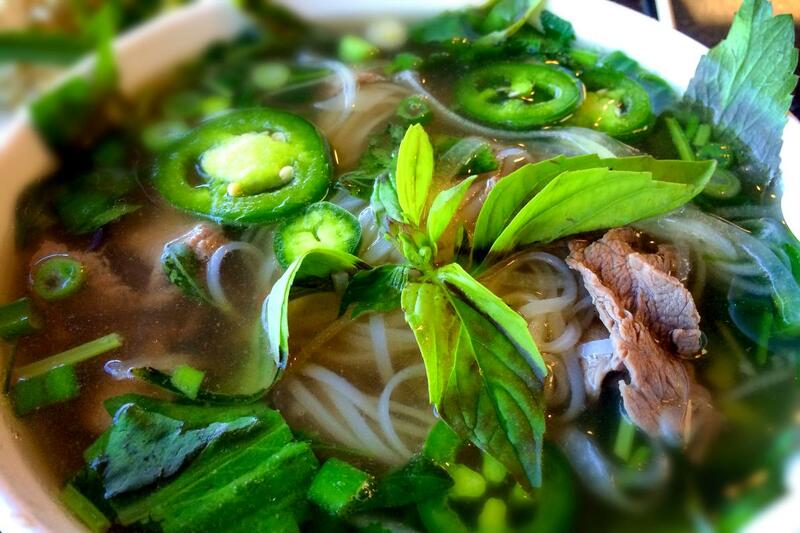 Beef pho at Pho 45. 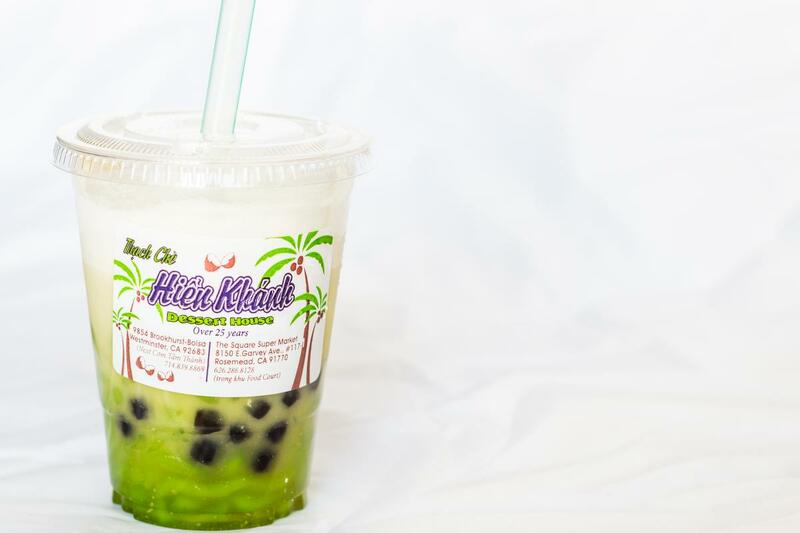 The #2 che at Thach Che Hien Khanh is a three-color che and one of the most popular. 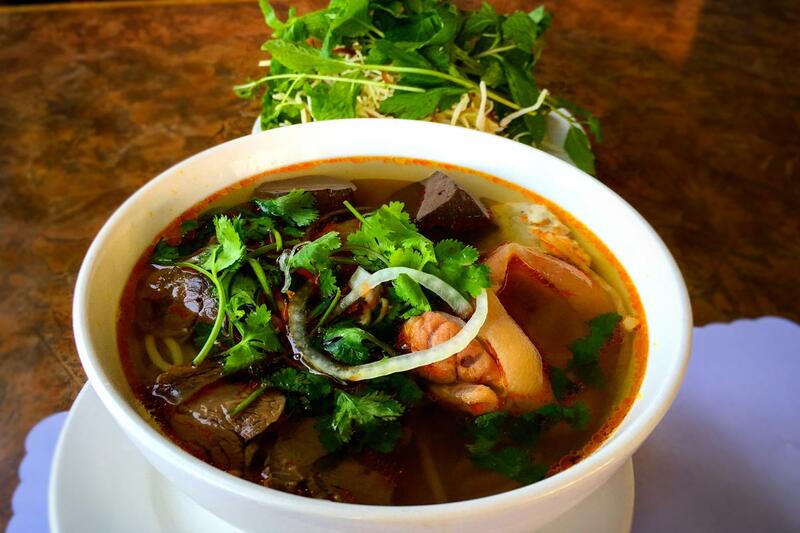 Bun Bo Hue is hearty noodle soup made with beef, blood pudding and pork knuckles, shown here at Quan Vy Da. Hearty, full-flavored vegetarian bun bo Hue at Nanh Duc Hanh. 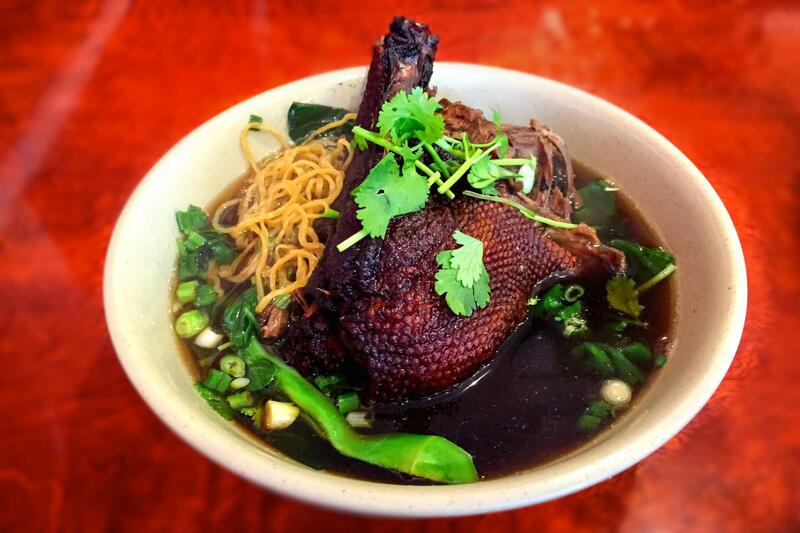 Duck noodle soup is the specialty at Phat Ky Mi Gia. 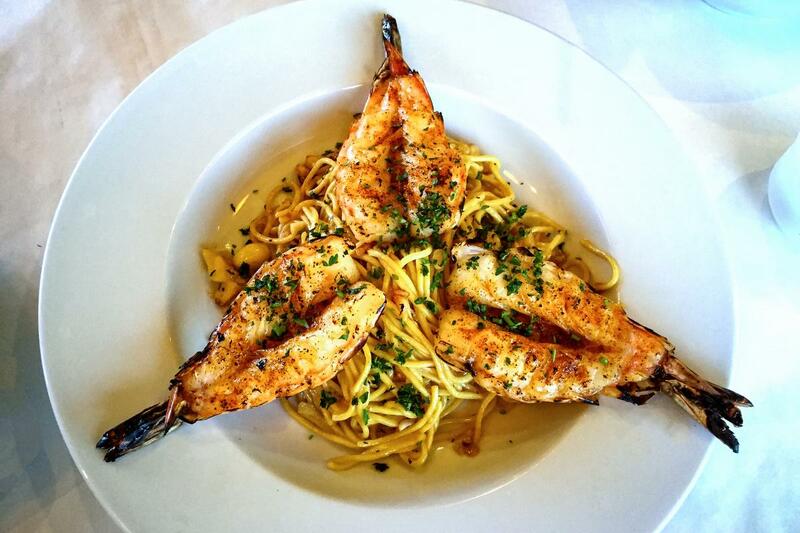 Grilled prawns with garlic noodles are on the menu at Fusion 11, one of the nicest restaurants in Little Saigon, which opened in October. 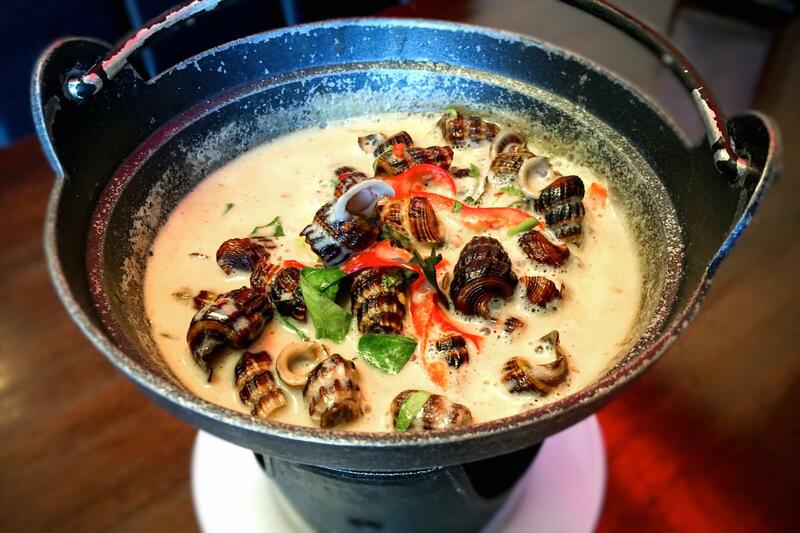 Snails in coconut curry at Oc & Lau. 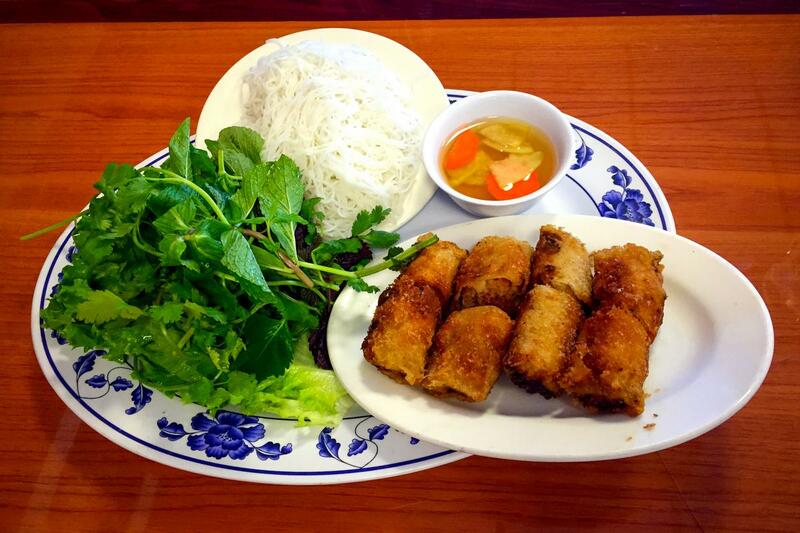 Bo De Tinh Tam Chay is a vegetarian Vietnamese restaurant in Westminster. Combo No. 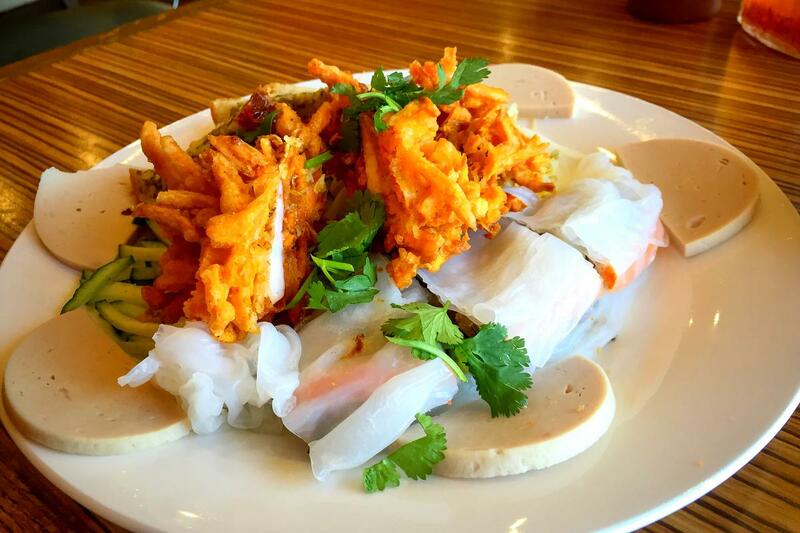 1 at Banh Cuon Tay Ho #4 includes banh cuon (wide rice noodles) and banh tom (sweet potato and shrimp fritters). 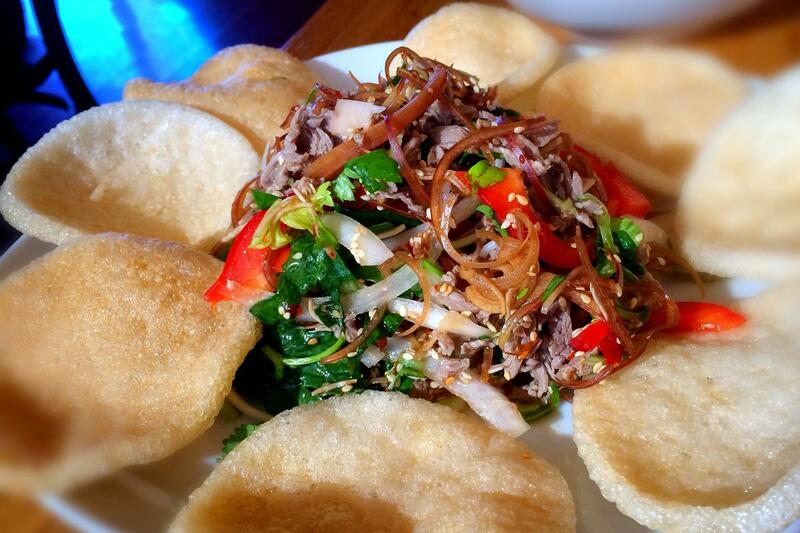 Goi bo, or beef salad, at Quan Hop is made with filet mignon and finely shredded banana blossom, served with rice crackers.